It’s not something we can take many credits for. Yes, we have given our very best and invested much in people, tailored inputs and improvements. However, we truly have been blessed by an enormous and quick growth of our Kids and Teens ministries – which surely nobody had seen coming with such incredible force. This does also confirm the great need in Cambodia. The youngest generation is hungry. Not just hungry for physical food – no, it’s rather a hunger for a spiritual support. Encouragement. Hope. Love. Joy. They lack it, we share it, they take it. They want more. They want their family, their friends to have it. And therefore we grow. Be aware though, that multiplication also comes with a great responsibility. Not only are we constantly empowering new leaders. But also there is the gathering space, the quality, the improvements all in all. Some months ago, we moved from our small former living room to the wide roof on the ICF Campus. 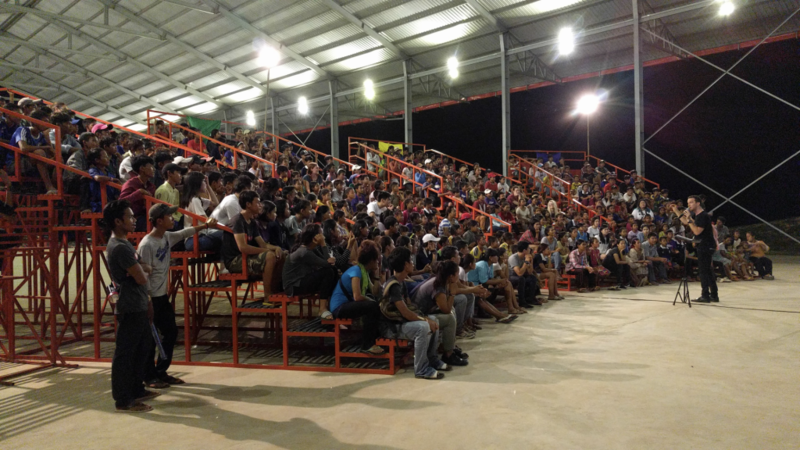 We had started sitting on the dusty floor, then received a generous donation to build a cement floor and bleachers. And now, there is a new step to take. There is too much distraction – we need walls to lead the concentration back to the front. The teachers need a stage as well as the worship team. Oh, and there is the sound. Yes, it travels, but not far enough. The speakers for 200 kids are now too small if 400 kids want to understand every word. More focus, more seats, and more comprehension – that’s what our ICF Campus Arena will provide. Therefore, an upgrade is about to be constructed. Already in our minds, we see the crowd is being fed more – and will grow further. Please support this project. Help us to build walls, a stage, buy larger speakers and other needed things. Ready to find out more? INFORMATION PDF. I have pledged for the ICF Campus Arena until the end of the year. Will you? Copyright © 2014 Vivien Bachmann. All Rights Reserved.